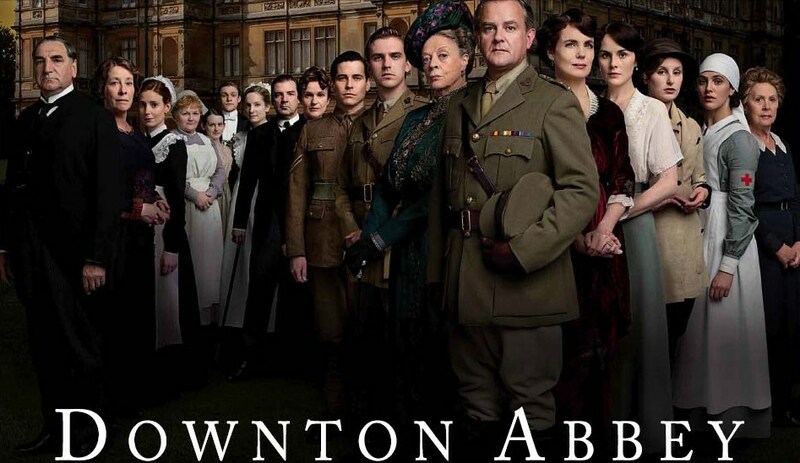 Tonight starts the beginning on the long awaited return to Downton Abbey, on PBS/WGBH’s Masterpiece Classic. If you were among the legions of devoted fans on both sides of the Atlantic who watched Season 1 you are undoubtedly excited about Season 2. (Those in the UK have already seen it). If not, you missed a fantastic series filled with lush sets and costumes, romance, drama, the sinking of the Titanic and the beginning of WW1. All in 4 x 1.5hr episodes. You can download it from iTunes or stream from Netflix, but you better get going, you only have 6 hours till tonights premier! Meanwhile, here is a visual recap of season 1 to help set the stage for the next chapter. 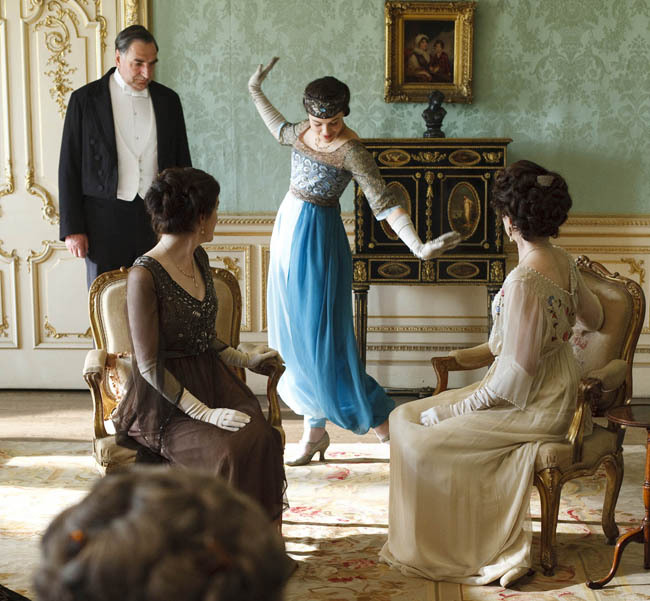 The Lady Mary Crawley, first born daughter and savior or ruination of the family – which will it be? 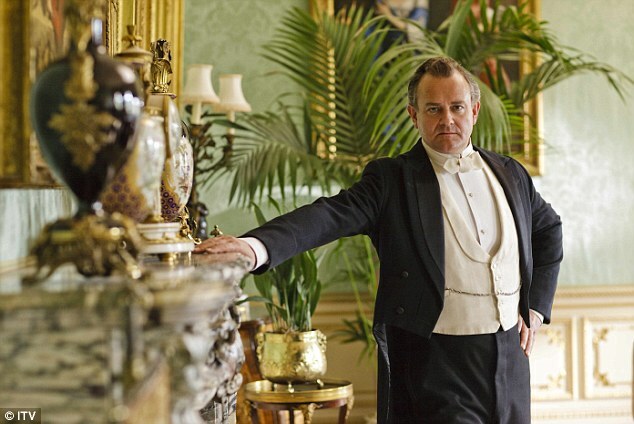 Robert, Earl of Grantham (l) and cousin Matthew Crawley (r), the unwilling distant relative set to inherit all. Will he and Mary find true love, or their senses? 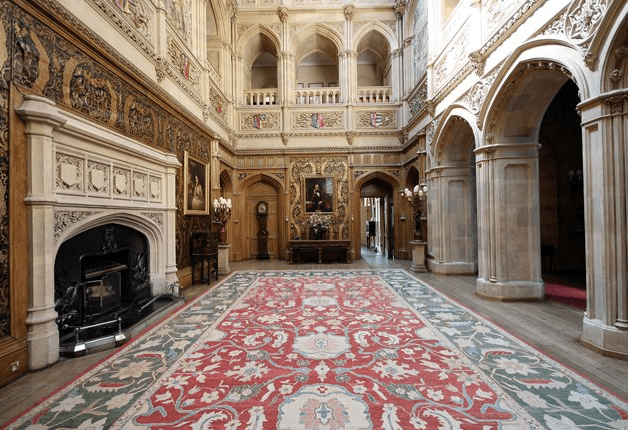 The image above and below are from Highclere Castle’s website. 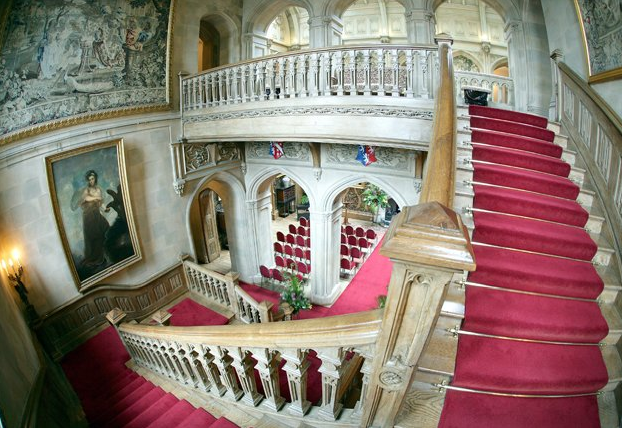 The grand staircase. You can see the main floor set up for a concert. 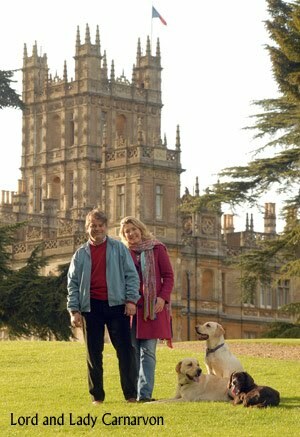 From Highclere Castle website. 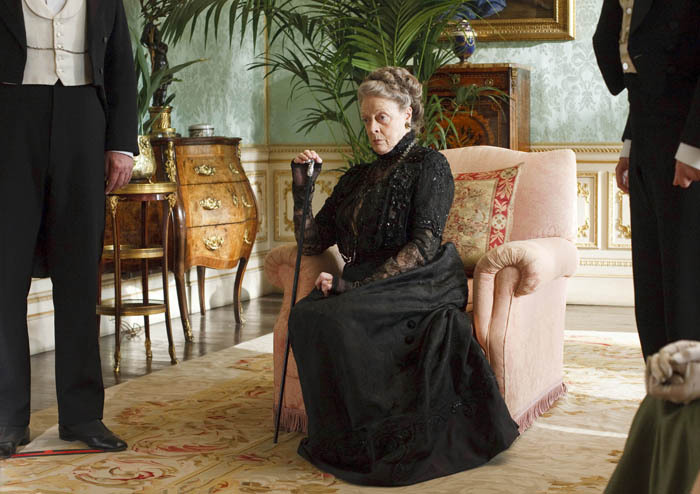 The ladies: Mrs. Crawley (Penelope Wilton), Cora, Countess of Grantham (Elizabeth McGovern) and Violet, the Dowage Countess of Grantham (Dame Maggie Smith). A meeting of some very strong feminine minds in the “observatory” which is set in the main hall. 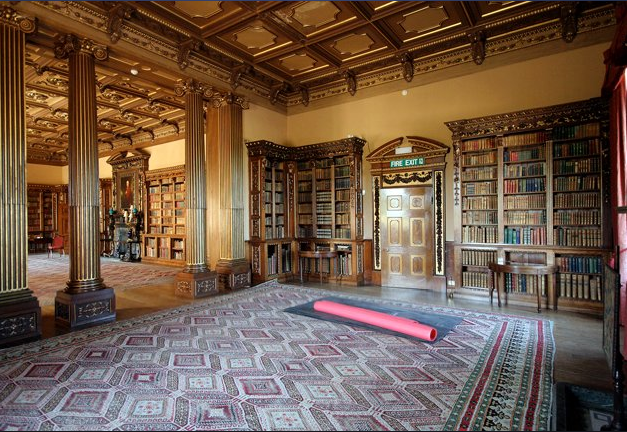 The Library is set with many items from the actual castle, including the carpet and some furnishings. 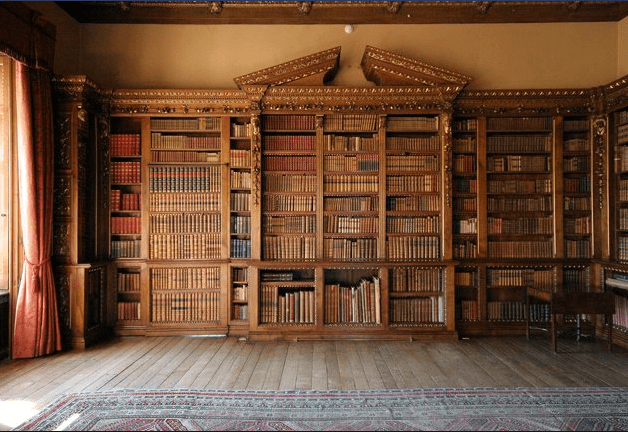 From Highclere Castle’s website. 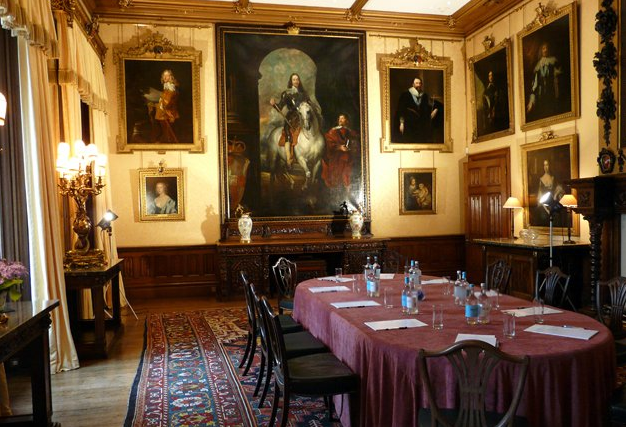 The library is often used for wedding dinners. 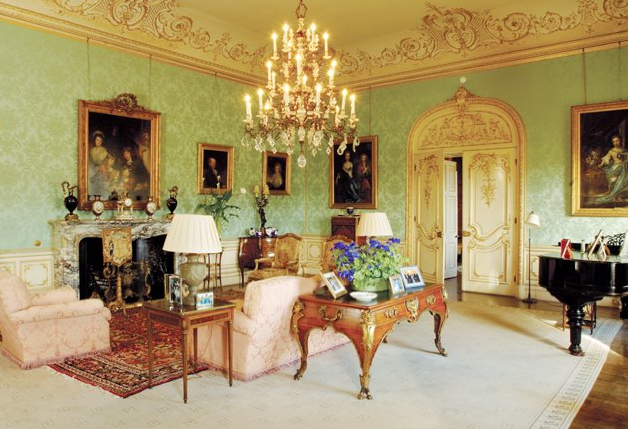 The drawing room is a sumptuous collection of pastel fabrics and textiles, gilded French Louis bergere chairs, English and Italian casegoods. 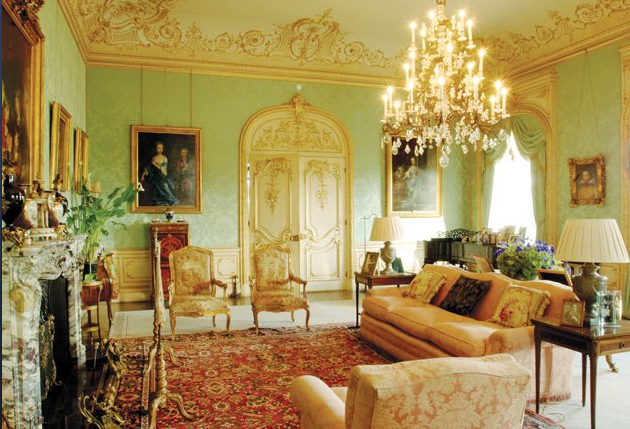 A view of the gorgeous Aubusson carpet. 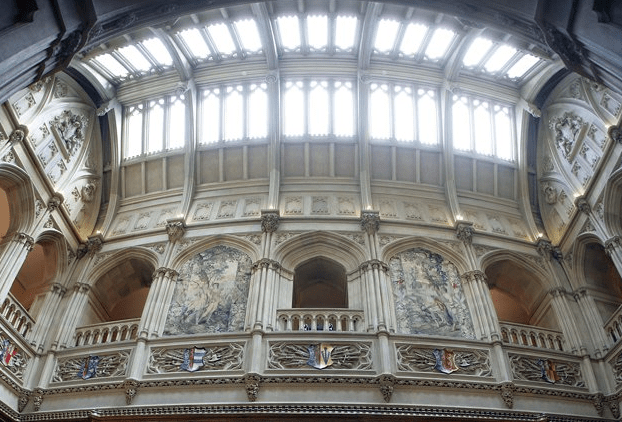 The images below are as the room appears today. Note that much of the furniture is the same, but the carpets are different. 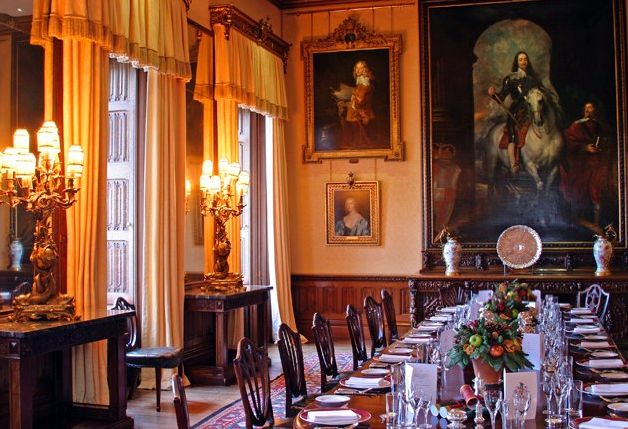 The dining room (from Highclere Castle’s website) as it is today (below). It features an enormous Van Dyke painting. 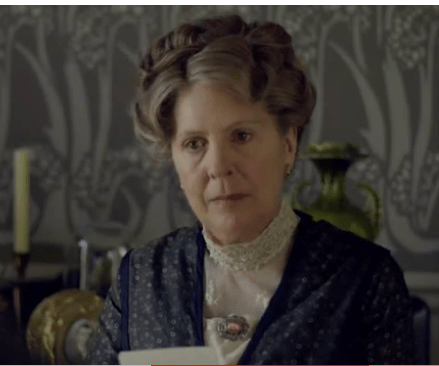 In the series, distant cousin Mathew Crawley, a solicitor, (shown here with his widowed mother) becomes the heir apparent of all of Downton Abbey when the closer cousins go down on the Titanic. 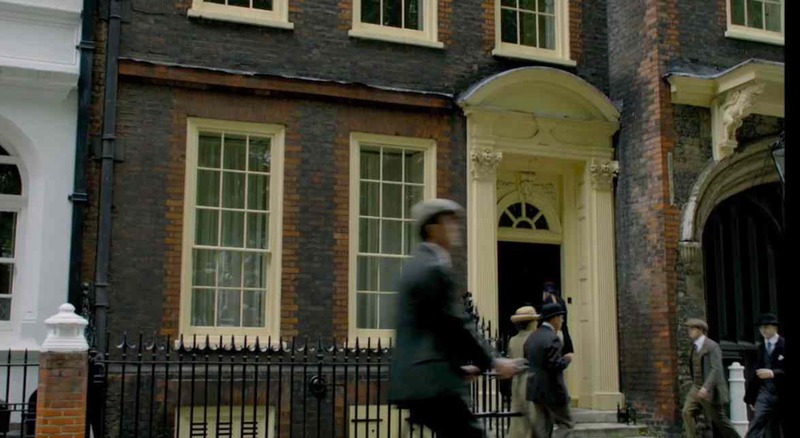 The Crawley’s are a middle class family living in a Townhouse in Manchester. 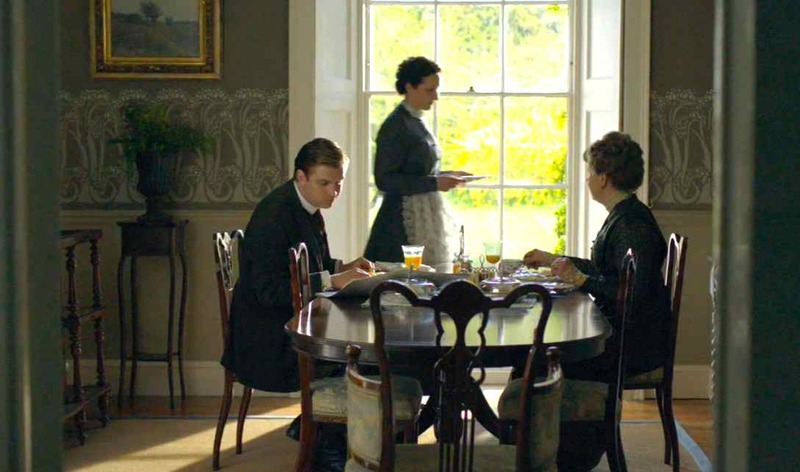 (middle class by Edwardian standards included household help). The wallpaper in this dining room is a beautiful William Morris paper, perfect for an early 20th century home. 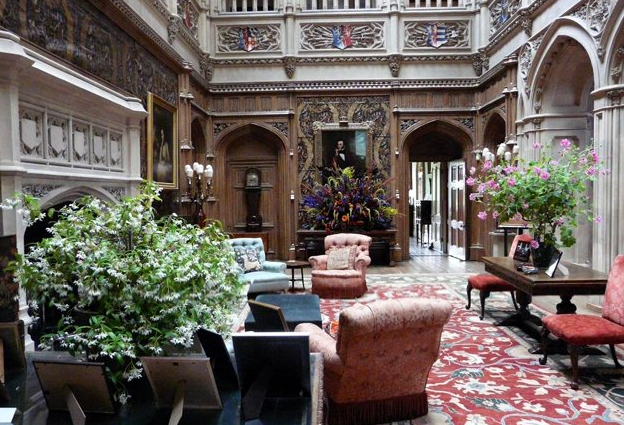 The Highclere Castle, located in Newbury England, has been home to the Carnarvon family since the 17th century. The current castle which was used for Downton Abbey, was designed by Sir Charles Barry in 1842. Barry also designed the Houses of Parliament in Westminster. The Castle is classic Gothic Revival which had its zenith in popularity in the mid-19th century. 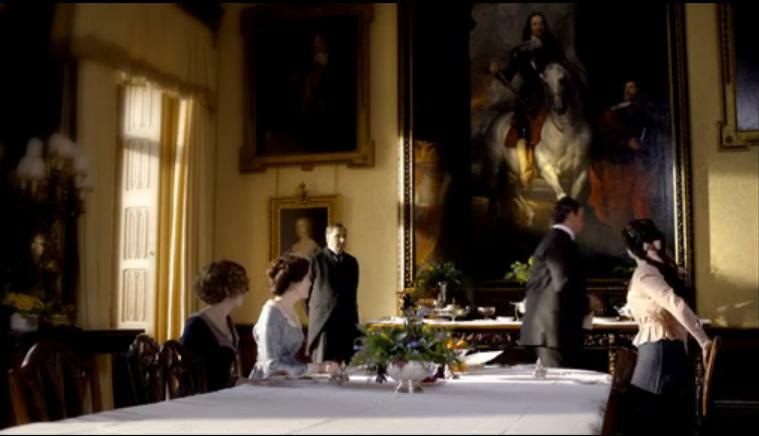 Last year, I did a fun post about “getting the look” of the Downton Drawing room, which you can see here.